The city of Sydney is not only the largest city in Australia, but also has the greatest number of cruise departures. Each year, Sydney is fortunate to see the best cruise ships visit its beautiful harbour. Cruise departures to Queensland, the Pacific Islands, Fiji, New Caledonia, New Zealand, and Hawaii are all popular destinations. 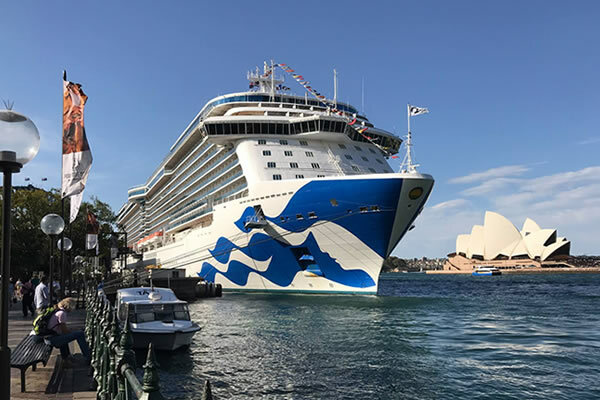 With cruises on offer from all the major cruise lines, and departure dates year round, cruise lovers are spoilt for choice when it comes to booking a cruise holiday departing from Sydney. Cruise lines operating out of Sydney during the 2019 season include: P&O Australia, Royal Caribbean, Carnival Cruises, Celebrity Cruises, Cunard. Princess Cruises also have several cruise ships departing this port, including the stunning new Majestic Princess cruise ship. Whether you planning a short cruise getaway for the weekend, or a longer cruise to really relax and unwind, there are many cruise options to suit all budgets. View our list of discounted cruises from Sydney below and book online today. Cruise ships departing from the port of Sydney may actually depart from two different terminals. Some of the smaller P&O cruise ships that are able to fit under the Harbour Bridge, will depart from the White Bay Cruise Terminal (near Rozelle). Larger cruise ships (including those from all other cruise lines such as: Royal Caribbean, Carnival Cruises, Princess Cruises etc) depart from the Overseas Passenger Terminal (Circular Quay). When you make a booking, your cruise documentation will clearly state which terminal your cruise ship departs from. This is the main departure point for most cruise ships departing from Sydney. The OPT is located at Circular Quay, immediately adjacent to the Museum Of Contemporary Art (MCA) and the historic Rocks area. If you are arriving by car, you can drive right up to the drop-off point in front of the OPT. If you are arriving by train, the best option is Circular Quay train station - approximately 200m from the OPT entrance. For those flying in from interstate, get the Airport Link train from Sydney Airport heading to Circular Quay. The current (2018) Airport Link prices are $18.70 per Adult, and $15.00 per Child (children under the age of 4 travel for free). A taxi from Sydney Airport to the OPT will cost approximately $50 depending on the time of day (travelling during morning or evening peak hours will be more expensive). If you’re lucky enough to be departing from Sydney on your cruise this season, be sure to use your last few days on land to soak in the city’s countless attractions. Cruises from Sydney are some of Australia's best when it comes to on-land attractions so you can certainly expect plenty to do in the CBD and surrounds. Dig into mouth-watering meals at King Street Wharf, fill your spare suitcase at Martin Place and Westfield and say hello to the marine animals at SeaLife Aquarium. Take a look below at the essential Sydney attractions for you and the family. No stopover in Sydney would be complete without truly shopping til you drop! From countless boutique stores to the massive Westfield Mall and Martin Place, you’ll have no trouble finding clothes, souvenirs and electronics to stuff into your suitcase before you board your cruise. If you’re staying in the CBD’s north, take a taxi or Uber and begin your shopping journey in the Queen Victoria Building and work your way back up to Sydney Cove. If you’re staying in CBD's south, however, begin your adventure at Circular Quay and work your way down to your hotel. By working your way from one side of the city to the other you’ll hit all of the best shopping hotspots and also be able to see some of the city’s most famous architecture on the way, like the Sydney Tower. Mouth-watering cuisines from across the globe are something you can't afford to miss when visiting Sydney. Being one of the most multicultural cities in the world means your choices of exotic and local foods are endless. We certainly recommended booking a dinner reservation at Bennelong, a restaurant in Sydney’s Opera House. However, if you’re in the mood for brunch or little more hustle and bustle, head over to King Street Wharf where you’ll find some of the cities hottest eat and drink spots. Take your pick of seafood, Italian, Greek food and a whole lot more. Sydney instantly becomes an action-packed, attraction-filled oasis for those travelling with the family. There are so many hotspots to keep the kids entertained that you’ll never hear ‘I’m bored!’ again. If you have a full free day in Sydney and want to make sure there’s something the kids will love, we recommend heading 30 minutes north to Taronga Zoo. Once you're finished there, make your way to Luna Park and once back in the city, cap off the daylight hours by saying hello to the 12,000 animals at Sea Life Aquarium and the boardwalk before 6 pm. Finally, dinner at Circular Quay or a restaurant around Sydney Cove is a fantastic way to end the day with a view of the Sydney Opera house that even the little ones can appreciate. For the adrenaline junkie or the avid football lover, Sydney is the perfect place to be. If you’re looking to see a football game, head out kayaking on the harbour or delve into the city’s rich sporting history, we have plenty of recommendations. We suggest getting your adrenaline rush from climbing the Sydney Harbour Bridge with BridgeClimb - just be sure to book in advance to make sure you save your spot. Being on the water might sound more like you, so take your pick of the city’s jet boat operators including Thunder Jet and Jet Boating. Football lovers have to take a look at the Events Calendar and book a ticket! Or just take a visit to your favourite stadiums, but always be sure you have a way back to the city from the stadium. When it comes to architecture in Sydney, there are a few buildings you simply can't pass on and they’re all in the CBD! If you’re architecture lover, leave at least half a day to travel the city and see the amazing buildings and attractions. Start the day off with the Sydney Opera House, then head down to the State Library of NSW before making your way into the heart of the city to see the Sydney Tower, Queen Victoria Building and Australia Square. Planning city architecture walks might not be your thing, but if Sydney’s architecture is on your sightseeing list, then consider an architecture walk with Sydney Architecture Walks. And there you have it, our essential attraction guide for anyone taking cruises from Sydney. Make sure you get the most out of your few days in Sydney and see all that Australia’s largest city has to offer before you depart.